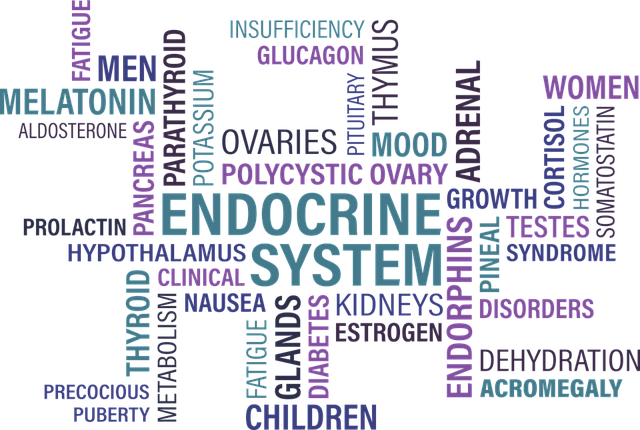 Thyroid disorder, either hyper or hypothyrodism affects either the over or under production of the thyroid hormone. There is no known cause that cause the disorder in the thyroid glands. However, what prompted me to write this article is because of the emotional factors that is stated in a book that I have read which really mimics the condition of someone I knew who also suffered from thyroid disorder. In the book, Knowledge of Life- Tales of an Ayurvedic Practitioner in Malaysia, Dr Vaidya C.D Siby (Dr Siby) shared a story of one of his patients, let’s call her Premila. She started to suffer from unexplained weight gain, hair loss and irregular periods. She was also constantly tired. It is not that Premila is overeating. In fact, she eat very little, going to all kinds of diet. She even put on weight when she ate nothing by yogurt for three whole days. Finally she went to consult an endocrinologist who through a series of blood tests and diagnosed her with thyroid disorder. In the first test report, her Free T3, Free T4 and TSH were not within normal levels. TSH was high at 96.4uiu/ml and Free T4 was 10.8 pmol/l. The doctor decided to put her on Levothyroxine 100mg a day. After 6 months, her Free T3, Free T4 and TSH levels were back to normal. Free T4 was at 1.93uiu/ml and Free T4 was at 17.9 pmo/l. However, she was not getting her periods hence the doctor placed her on contraceptive pills. In fact, she reacted badly to the pills- she was depressed all the time and put on more weight. She was only 35 years old and not yet married! What absolutely horrified her was that the doctor told her she would have to be on medication for statins as a preventive measure. Meaning, putting her on medication for a condition that has not yet existed! And Premila herself is a doctor by profession, hence she knew these were bad for her. Premila decided to check herself into Dr Siby’s center to undergo ayurvedic treatments. She was given massage to her body, a clean diet of porridge, followed by Virechanam or induced purging. This is not unhealthy method because there is a specific method of gathering all the toxins to the digestive track and then excreting them from the body. For the first time in years, Premila slept well. What I like about this book is that it introduces about Ayurveda, as well as Dr Siby shared on the detailed case studies and often the emotional factors associated with the health conditions. Dr Siby believes that a lot of causes in health problems stem from emotional causes. He can prescribe Ayurveda treatment of massage, special diet to help to nourish the body as well to expel the toxins out (either through purging and/or induced vomitting- this is not to be confused with bullimia as the toxins are made to concentrate to the digestive system before being expelled out). Halfway through the treatment, Premila started sharing with Dr Siby her story- she was 20 years old when both her parents died in a car accident. She had a brother who was 5 years younger than her who was still schooling. Premila decided not to give up medical school and went back to college after the funeral. When she completed her studies, it was her brother’s turn to enter. But he refused and insisted he did not need her help. He left home and disappeared for two years. Later it was found that her brother went into rehabilitation center for drug addicts. Her brother was angry and basically blamed her for what had happened to him. On the other hand, she was working so hard as a young doctor and at the same time she had to endure the blame of her brother to her. Dr Siby consoled Premila that she still continue to love her brother but do not accept the kind of blame talk from him. He said just because we are intelligent and good, don’t expect people to be good to us. Premila cried and it was as if the entire burden of caring for her brother has been lifted and she can now concentrate on her own healing. She continue the Ayurveda treatments. Three months later, she went to see Dr Siby and was smiling and happy. Her blood test showed she was back to normal. Even her menses were back to normal and she need not take contraceptive pills. She still took Levothyroxine but at a much reduced rate. This one sentence encapsulates a lot what I explain to many of my patients: even though the treatment I give is a physical one, my aim is often to make the patient regain his sense of self-worth and confidence. You have to listen to your heart and do what you feel is right for you. There is no need to suffer unnecessarily by listening to other people’s negative perception of you. Premila’s story is similar with a dear friend of mine who also developed a thyroid condition after a family issue where she was being blamed for what that had happened when the starting point was not her fault. In life, there are many things that we would have done differently if we could turn back time. Even in my own life, there are some particular events that I deeply regretted. I make amends because I know I could not go back to the past but I could shape my future through what I do in the present. A mistake is meant to teach us never to repeat it in future. However in the case of my friend, I knew the grief, guilt and regret is eating into her causing her hormones to run out of order. If you have developed a thyroid condition following a tragic family misunderstanding where you felt you are part to be blamed, please release your guilt and move on. If there is something you could do to make amends, then do what you can. But if someone else is adopting an attitude of blaming you for what happened, understand that no one can really determine someone’s else destiny. I have seen an ungrateful grown child who blamed her mom for everything bad that happened in her life- even though she had sacrificed so much for her children- she got divorced from a man who was both a gambler, wife abuser and womanizer and worked three jobs to raise both her kids up. Her son was grateful to her mom but her daughter choose to run away from home each time her mother objected to her relationships with rotten men. Eventually her daughter came back when pregnant and her mom took her in and helped in her wedding and then helped to take care of her daughter’s child. After the child is old enough, her daughter then make up some sort of excuse to blame her mom and took back the child. Needless to say, this poor lady also develop a host of health conditions including bloating and unexplained weight gain. If there is underlying emotion factor in a disease that is not being addressed, it is very hard to cure the condition. Do seek therapy and counselling to help deal with the condition. And do not let your children or siblings blame you for failures in their own life. Many people rise from adversities because these experiences would rouse us to get up and change our lives instead of sinking to a ground and be a loser. Even if a person chooses to be a loser, it is his choice and he should never blame another person for it. Please don’t work yourself up and allow yourself to be guilt-ridden in life which affects your body and health. I have dealt with my share of people who like to throw blame at others even though it is not other people’s fault. Instead of feeling angry or upset at being accused, nowadays I feel pity for these people because I noticed that these people generally are not able to sustain any meaningful and happy long term relationship because they spent their whole life blaming others instead of owning up to their problems. They would never be able to grow and never experience the freedom of happiness and being accountable knowing that they can shape their own life’s destiny.